First we can experiment with the Piezo disc. Solder a 5 mm transparent Red LED to the Piezo disc. Solder the Anode of LED to the White Piezo material and Cathode to the Metal plate. 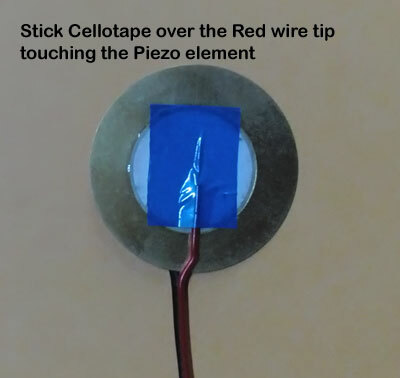 Stick Cello tape over the Piezo material so that the solder points will be intact. Just tap on the Piezo disc. You can see the LED flashing. When we tap on the Piezo disc, the Piezo ceramic crystals re orients and returns alternately. This generates a momentary voltage around 2-6 volts. So the LED flashes. 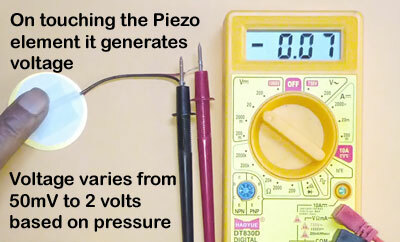 Go to the link to see the Video showing Piezo electricity. 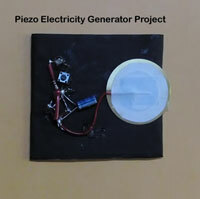 Now we can make a good Piezo Electricity Generator circuit. You can procure a 40 mm Piezo element from a large Buzzer or you can purchase one that costs only Rs.5. 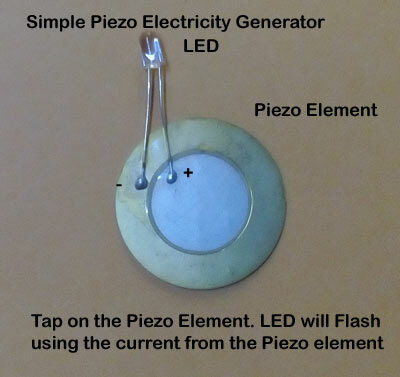 The Piezo element has two sides. On one side of a circular metal plate, the Piezoceramic material is coated. This side is the Positive side. The bare metal part is the Negative. You can solder wires on the positive and negative sides. But you should be careful while soldering on the Piezo ceramic material. Tin wire and place on the White Piezoceramic area. Apply solder just once only . If you place the soldering iron for long time, the Piezo material will melt. 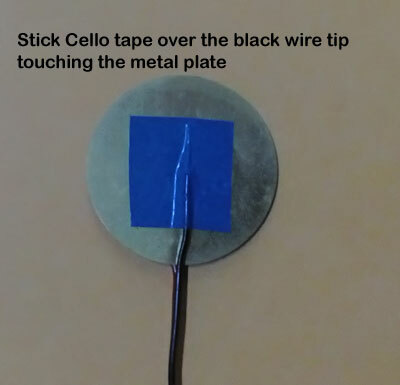 Stick some Cello tape over the solder point to prevent the detaching of wires. The Piezo material is a thin coating so handle gently. 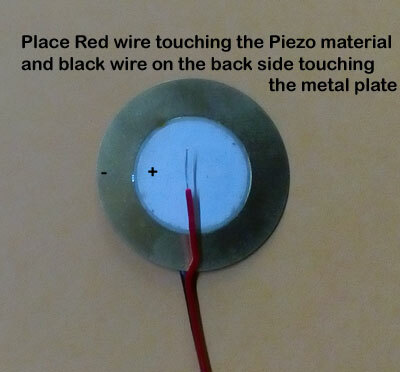 Make the Piezo disc assembly as shown in the images below. Now let us check it’s working. It is generating around 50-100 Milli Volt with a mild tap. Now see the Circuit diagram and assembled unit. How to demonstrate the Piezoelectricity. 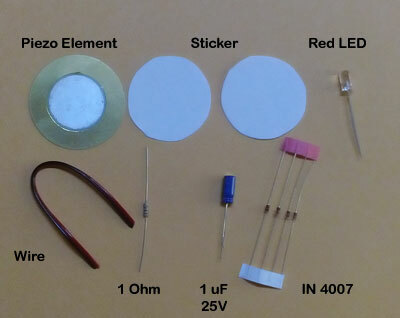 Place the Piezo disc on a Thermocol or Sponge. Strongly Press on the Piezo disc many times using the thumb. Continue the process for 5 minutes. So the Capacitor starts charging. After 5 minutes, press the switch. LED flashes momentarily will full brightness. 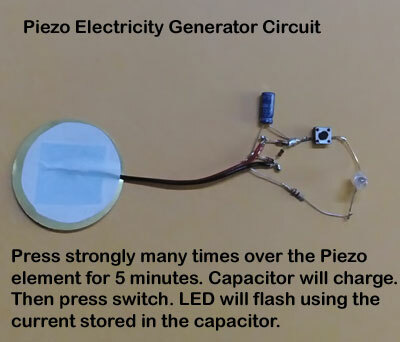 This is due to the discharge of Piezo electricity stored in the Capacitor. 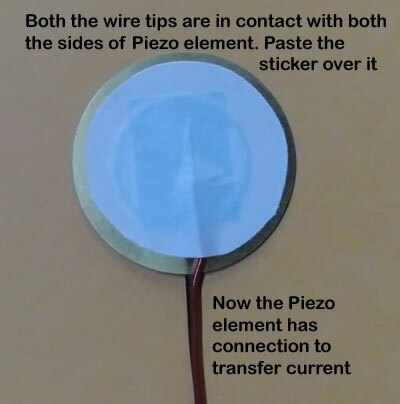 Read the theory of Piezo Electricity. Piezoelectricity is the phenomenon in which piezoelectric materials generate a minute voltage when mechanically stressed. The Piezoelectric effect is due to the asymmetry in the crystalline structure of the Piezoelectric materials. A good example is the Lead Zirconate Titanate crystals used in the Piezoelement of Buzzer. This can be used to demonstrate piezoelectricity. The Piezoelement behaves in two fashions. When it is subjected to an electric potential, it vibrates due to Indirect Piezo electric effect and produces sound. This is the principle in the working of Piezo buzzer. But if the Piezoelement is subjected to heat or mechanical stress, it generates around 1-2 volts through Direct piezoelectric effect. Piezo element is a circular shaped metal plate with a thin coating of Piezo material. The Piezomaterial used is Lead Zirconate Titanate. This material exhibits both Direct and Indirect piezoelectric property. Indirect piezoelectric property is the vibration of the piezoelectric crystals in the presence of an electric field. The piezoelectric crystals also show direct piezoelectric property in which a mechanical stress like vibration or application of heat generates around 1-2 volts in the Piezoelement. The white Piezo material coating is Positive while the rim of the element is Negative. How to handle Piezo element? Piezo element is prone to weather changes and aging. The piezoelectric property may deteriorate due to aging and the buzzer may fail to work. The Piezomaterial is coated as a thin film so that during soldering, the wire along with the Piezomaterial may detach. Once a portion of the Piezo material is detached, that element cannot be used. So always use very thin wire and apply solder only once. Over heating may damage the piezomaterial. If it is stored, use a plastic cover and keep it in a place free from moisture and heat.